Argy, an ardent Star Wars fan, was thrilled to receive a birthday party invitation. The dress code was to be Jedi robes. Master 5 was beside himself with excitement and began counting down the days. Meanwhile I surveyed our Jedi kit. Whilst we seemed to be blessed with a surfeit of lightsabers, there was nary a robe to be seen. So I turned to the font of all knowledge (Google) for advice. 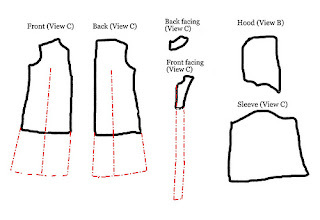 I felt sure there might be a tutorial or two showing how to construct such a robe. But as I waded through the search results, I began to feel as if I had entered a parallel universe. 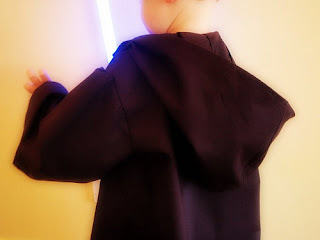 Rather than finding simple instructions for making Jedi robes, I started to find passionate essays arguing fabric selection and seam placement. For example, its seems that no Jedi worth their telekinetic powers would be caught dead in polyester. Not even a poly-blend, for more your wash-and-wear Jedi. No siree, apparently its natural fibres or nothing. And don't get me started on the two-piece sleeve. Apparently seams are a monumental fashion faux pas. Its enough to have you declared padawan non grata. I realised as I kept reading that there are people out there, bless them, that think they are actual Jedi Knights. At this point, I'm afraid I ran screaming for the reassurance of a commercial pattern book. 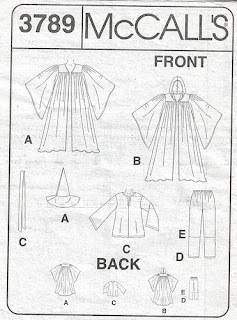 And so it was, that I ended up finding McCalls 3789 - a costume pattern for a hat, tunic and robe. In a stroke of legal genius (and clever avoidance of trademark infrigement), it was described in the pattern book as Lord of the Stars. Feeling confident in my ability to tell my Boba Fett from my Bilbo Baggins, I snapped it up. Of course I almost fainted when I examined the envelope and realised that a hooded robe would need nearly 7 yards of fabric. Are you kidding? For a costume? For a 5 year old? Warning: if there are any real Jedi Knights reading, please avert your eyes now. I made an executive decision that loose-fitting Jedi robes were very 1980. All that excess fabric should have gone out with shoulder pads, leg-o-mutton sleeves and leg warmers. So, I crossed to the dark side altered the pattern. I cobbled together various pieces of Views B (robe) and C (tunic) and effectively used about half the fabric requirement. There were a few bits of redrafting to do, including a bit of lengthening and spreading, but all in all it went remarkably well. Pivotal to the success of course, was that old dressmaking rule: always include 8" of fitting ease to allow for the wielding of a lightsaber. Your little Jedi looks very happy with his robe. That is all that really matters, isn't it?! The force is strong with this one. My Jedis have been requesting robes for a while now. Thanks for the tips. as in where's miscones and mitea? 'padawan non grata' - hahahahhaahahahahaha. 7 yards??? Yikes - Lined with gold I am? That is great. 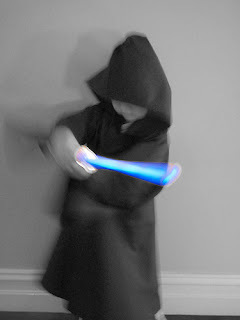 It is weird that people really think they are jedis... it si kind of scary too... Mega mum points for this one! Excellent work there Liesl. Very authentic looking robe. I don't think my kids would be able to walk if they were covered in 7 yards of fabric. Good job! Nice find! 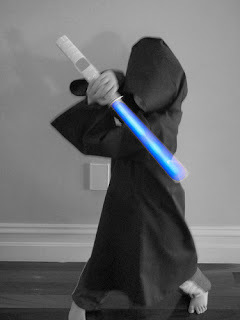 I did in fact look up Jedi robe patterns for my nephews, it's a bit spooky out there eh! Hey, what's that I see as View A? Is that a light-sabre cover? Love the model poses, too cute! OH Lisel your robe looks fabulous and I'm sure any Jedi Knight out there would be thrilled to be wearing it. Unfortunately I have had my own exprience with Star Wars craft. A while ago, I was asked by a man, a grown man, to make a crocheted Darth Vader for his "film". I turned to Google too ( feeling there was no hope) and was pleasantly surprised, and then not so as i began to read more and more. reading your post is like re living it I tell you. ha it looks great!! definitely don't need 7 yards of fabric then! I'd promised my husband and a friend that "one day" I'd make Jedi robes for the three of us. Well, "one day" came and I started researching. I got scared off by the huge amount of fabric required! I ended up finding a place online that makes the robes for less than the fabric would cost me instead. I'm supposed to get the robes tomorrow... I hope they're worth it! Now, THAT is very cool. Your utter cleverlessness never ceases to amaze me. Talented, you are. What a great end result! My brother said I would make a fortune if I made Jedi robes to sell. But it turns out that every Jedi in every movie (or near enough to piss me off) has a specific style robe and a specific colour and that is Very Important. The geek world is vast and detailed apparently. And seriously 7 yards? Oh my! I would love to have a costume like that when I was a kid. It would be a sensation.